Normally, I translate any Dutch words I use on the blog by putting the English translation in brackets directly afterwards. But with this particular word, that is an impossible task. So much so, that it requires a whole blog post! In addition to “cosy” just not cutting the mustard, an English speaker wouldn’t use the word cosy in the same context as Dutch people use gezellig. You would never hear an English person say, “That was a really cosy evening.” EVER. That’s another close one. Close, but no cigar. Sure, in some instances, you could use comfortable… but “That was a really comfortable evening.” NOPE. Again, close, but if it was ONLY fun, you’d say “het was leuk” (it was fun). Gezellig is on another level. Sloeberjong: Lekker is used a lot, but I do keep wondering when your blog about “gezelligheid” will premier. It’ll be a challenge to explain that to non-Dutchies! Tanja: No translation is proper for the word gezellig, it means that people are having a good time, but it can also mean that your house looks cosy, or comfortable. Or if people do not get along that is ongezellig. Thomas Gresnich: What I miss is the word “gezellig”, meaning something like cosy. Everything is “gezellig”, like: come for a gezellig kopje koffie. Are you coming tonight? Ja, gezellig. How was the party? Very gezellig. Why don’t you stop smoking? I find it so gezelllig, een sigaretje (a cigarette). Rockerriert: Cosy is only part of the meaning of gezellig. There’s no English word that covers the whole meaning. So, just what does this word mean? The atmosphere (at a pub, for example) can be gezellig. That feeling of a pleasant, friendly ambience and having a good time. It can also refer to the notion of belonging, time spent with loved ones, seeing a friend after a long time apart, or general togetherness that gives a warm feeling. Hey, even smoking can be gezellig! It encompasses such a broad range of descriptions, emotions and uses that it simply cannot be translated to any other language in one word. And what’s this Gezelligheid you speak of? Gezellig is the adjective form and Gezelligheid is an abstract noun. So adding -heid roughly translates to -ness: coziness, togetherness, gezelligness. Dus, ik zei het nog een keer: gezellig is gewoon gezellig. So, I’ll say it again: gezellig is just gezellig. Come to the Netherlands and experience it for yourself! Lijkt me gezellig! The word “gezellig” is closely related to the word “gezel”. “Gezel” is the Dutch word for an apprentice in a medieval guild, i.e. a journeyman. This word “gezel” stems from a much older Old High German word that meant “housemate”. If I’m right, then “gezellig” pretty much describes everything or anyone that makes you feel at home. Good post. I love the word gezellig and wish we had an english equivalent. For egample…how would you describe 3 six foot dutch men across the back seat of a moris minor? Ja…gezellig! 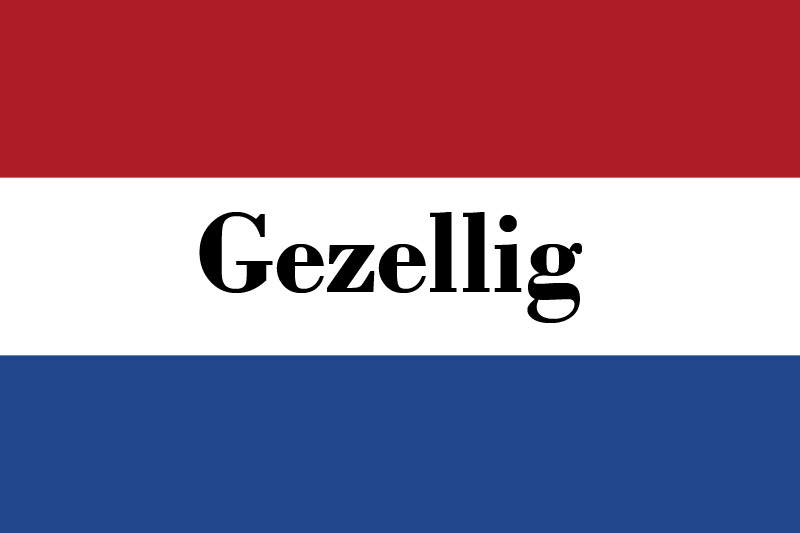 I never truly understood the meaning behind ‘gezellig’ until 2 months into my Utrecht experience when I went for a meal with extended Dutch family. Everything about that evening was ‘gezellig’ from the conversation, to the people, to the decor, to a hilarious occurrence with my friend’s scarf, to eventually leaving the house and going to Boulevard for a sneaky biertje (it was a saturday night after all! ),to the cycle home afterwards slightly inebriated but very happy 😉 To me, gezellig cannot be explained, it has to be felt! Oh god I love that word! There’s literally no good equivalent for it and I miss using it so much now that I live in Dublin. Sometimes you just really want to put on some gezellige socks and have some gezellige tea with friends! And what about the (American) English ‘great’? To me, that comes the closest to ‘gezellig’ but, like any all-encompassing word, it depends how you say it! No! Great is so superficial, so fake. But that is partly because I imagine an American saying it, so you have a point adding it depends on how you say it. This! Gezellig really can’t be translated, not in English, and not even in my native language Finnish. I mean, how would you translate something in one word that can be used to describe almost anything from a person to giving birth at home with no pain relief? Impossible. When i try to explain the word gezellig is usualy say to people it means there was a good atmosphere or a very nice vibe. It’s easy to explain to Danes. By one word. In Afrikaans gesels means chatting or gezelzen in Dutch, which occurs in van Dale dictionary but not in Google translate. Gesellig in Afrikaans is used mostly in the same way as gezellig in Dutch. Apartheid ook zo’n leuk/gezellig Nederlands woord. There is a Yiddish word that comes close: “Haimish” which, I think, has something to do with “home”. When I feel that a situation, a house, a person or an activity is gezellig, I feel it very viscerally. It is a *good* feeling. A feeling that makes you smile, but not a broad smile. Like a “knowing” smile, maybe a grin. It’s a feeling in your heart. It just makes you feel good. Makes you think of the expression “aaaaaaahhhhh….”. Sometimes I think it can be interchanged with the phrase “good atmospher”, like in Spanish they say “ambiente”. Anyway, it’s something you need to experience to be able to feel and identify. Oh and I would love to, but no one would be able to pronounce it! I am a Danish expat living in the Netherlands and I actually fully understand ‘gezellig’. In Danish we have the word ‘hyggelig’, which is a precise translation of ‘gezellig’. In Denmark people also say that no other language has a word for ‘hyggelig’, but then again not many Danes know Dutch. We take it one step further than the Dutch take ‘gezellig’. We use it as a verb: ‘I aften skal vi rigtig hygge’ meaning ‘tonight we will really be having a gezellig time’. Thank you Bitterballenbruid for your lovely blog. I discovered it a couple of days ago and am making my wayt through the archives with great reading pleasure.